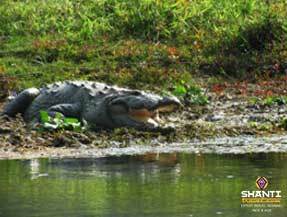 For those who do not know the Royal Chitwan National Park, know that this was the first national park to be established in Nepal in 1973. It is located in the southwest Terai region of the country, where we find the ethnic Tharu. I am writing these lines beside a wood fire in the moonlight, listening to the frogs sing along the river. This morning when I woke up, nothing could have prepared me for what I was going to experience or see! We arose early to go watch the horned rhino on elephant back! Despite the influx of tourists, it is nonetheless impressive to traverse through the jungle on the back of one of the largest mammals on our planet. The ride lasts an hour and a half and takes you through the vines of the forest to observe the animals that inhabit this 932 square kilometer park. I spotted a fox, nine deer, two peacocks, many birds and of course elephants! Your children will be amazed by this safari! Unfortunately I regretfully noticed that some travelers had little respect for the environment. Do not hesitate to gently reiterate the rebellious slogan “respect” for the environment and for the reserve that is listed as a World Heritage Site by UNESCO. Waste should be thrown in the trash and silence should be kept so as to not disturb the animals who are in their natural habitat! We returned to the lodge for lunch before returning to the tranquil waters of the Rapti River in a canoe. This activity was just great! 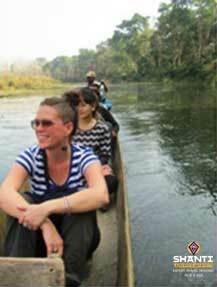 The canoe sways through the park, exposing dozens of species of birds and many crocodiles that occupy the banks. My naturalist guide gave me a lot of information about the animals and their ecosystem. 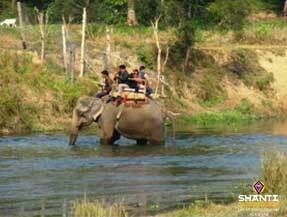 A must-do in your day in the Royal Chitwan National Park! At the end of the canoe ride, you can go hiking in the jungle for about an hour to an hour and a half. Not having seen a rhino, I decided to try my luck once more. I stayed on guard for my chance encounter, ensuring that I do not miss it. It had been 30 minutes since we had started the walk. 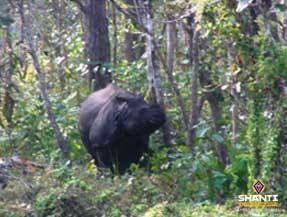 My guide gave me some advice in case we had to face a rhinoceros, a tiger or even a black bear. Suddenly, he stopped dead! We heard many sounds through the trees. We waited for 5 minutes, and then nothing happened for a while. So we continued our journey and I began to get a bit pessimistic. We stopped again and I strained my ears once again to hear something promising. And then suddenly my heart did a 360, as less than 15 meters away on the other side of the river, was a rhino mother and her baby! I could not believe my eyes! I smiled from ear to ear as I was in the heart of the jungle and in front of me was not one but two horned rhinoceroses in the wild! WOW! The manager of the lodge had predicted spotting two rhinos before my departure and I can tell you that I laughed when he told me that! We were able to observe them for 15 whole minutes, squatting in the mud just a few yards away. It was truly a fantastic experience. It was with a light heart and a smile that I returned to the lodge to write to you about my wonderful experience in the Royal Chitwan National Park!